The Simply Calphalon® best nonstick cookware surface is made of hard-anodized medium-gauge aluminum with easy-to-grip silicone over stainless steel riveted handles. The finish of the pots and pans is brushed in a gray color with black bottoms. 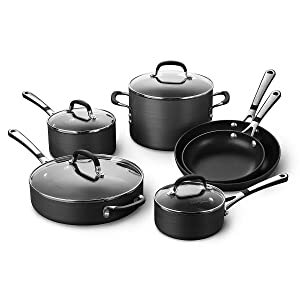 You will receive in the 10-piece set an 8- and 10-inch omelet pan without lids, a 1- and 2-quart saucepan with lids, a 3-quart sauté pan with lid, and a 6-quart stockpot with lid. The tempered glass lids have easy grip handles on top and will not get hot to touch. There is no hole for venting in the glass lids on this set. This set also comes in 14-pieces for a larger family with open stock for miscellaneous pieces and replacements. Do not use cooking sprays, butter, or oils with these pots, pans, and skillets. The set has flat bottoms to sit on the stove nicely. This cookware is PFOA-free (perfluorooctanoic acid) and has two layers of the nonstick coating. This set is Simply Calphalon® Nonstick and not the Simply Calphalon® Easy System so not to be confused. PTFE (polytetrafluoroethylene) is used in manufacturing the Simply Calphalon® Nonstick line of cookware. It is safe when you cook at normal temperatures. Read the Use and Care guidelines so that you will not cause any damage to the no sticking surface that is slightly rough. If you want to nest the set inside one another, use a paper towel so they will not scratch. This set is ideal for everyday cooking from reheating leftovers, soup, and great for steaming rice. The very hard-anodized aluminum will give you even heat on the bottom and up the sides of the cookware. The double-coated interior will not have your fudge, caramel, fondue, and cheesy sauces stick. Simply clean with dish detergent in warm water, rinse, and towel dry. Gift-wrapping is available for a loved one or friend. A User’s Manual is included with a full 10-year Warranty.